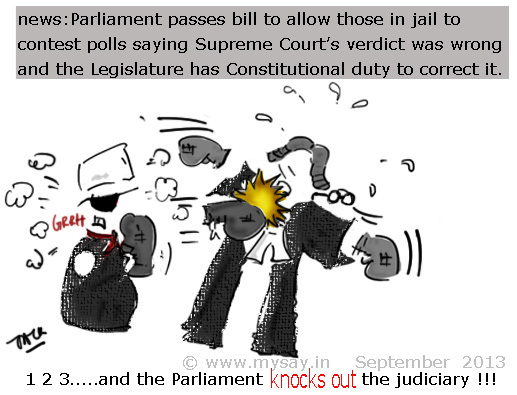 The Parliament passed a Bill to allow candidates in Jail to contest polls against the July 10th decision of Supreme Court which refrained such candidates from voting and contesting.It was sited that the court verdict was wrong and the Legislature has Constitutional duty to correct it and hence the Bill. Interestingly,it took only 15 minutes for this bill to be passed and Leader Of Opposition, Sushma Swaraj pushed for its passage even without a debate. After all jailed candidates may be vote-bank leaders. Who cares why they are jailed? Hah! Andar kuch bahar kuch!…..
haw! Indian parliament and it’s stooges oops stalwarts! Very serious issue! I am not feeling safe at all. Well portrayed 🙂 But a sad thing !